BYD’s eBus, shown in Los Angeles, can run 155 miles on a charge and has led to contracts with transit agencies in Los Angeles and Long Beach. LOS ANGELES — THERE’S a newcomer to this city’s auto row. Compared to the shiny showrooms displaying the latest Mercedeses and Toyotas, the Chinese carmaker BYD’s outpost in the shadow of downtown skyscrapers looks rather forlorn. Just two of its models — a red electric sport utility vehicle and a brown gasoline-powered sedan — are on view in an otherwise empty storefront. But it’s the pair of 40-foot-long battery-powered buses parked across the street that is driving the company’s ambitions to become the first Chinese automaker to break into the United States market. 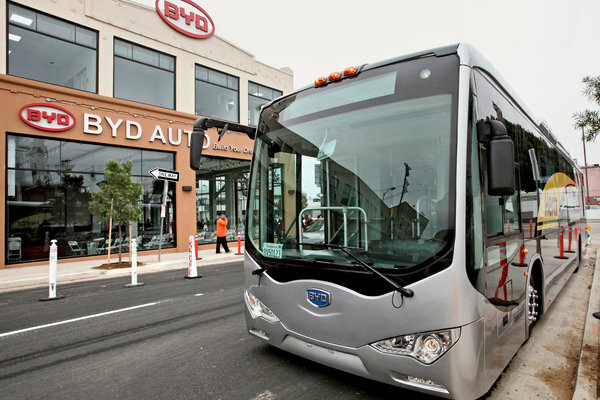 BYD this year became the first Chinese vehicle company to open manufacturing sites in the United States, building an electric bus assembly plant and a separate battery factory in Lancaster, a desert community 75 miles north of Los Angeles. The $30 billion company beat American competitors to win contracts to build electric buses for transit agencies in Los Angeles and nearby Long Beach. BYD is also pursuing deals to supply electric shuttle buses to rental car agencies, amusement parks and Silicon Valley technology companies. In New York, the Metropolitan Transportation Authority began a two-month road-test of BYD’s battery-powered eBus in September.